I'm continually thankful that I live with someone who's not a picky eater, someone who will eat pretty much any meat or vegetable, in any shape or form, and isn't afraid to try new foods. I may actually be the pickier one, in some cases, since I'm still pretty unwilling to eat beets, and don't really care for cilantro or parsley, unless it's just a tiny bit, and blended into the dish so that it's almost unnoticeable (I had to pick off all the large parsley sprigs you see pictured and push them to the edge...). A few nights ago, Jamie made this fantastically flavorful seafood stew, from a recipe he found in January's Food and Wine. They called it just plain "fish stew", which I thought didn't quite sum up how wonderful it is, since the fish actually comes in third place, in my mind, to the beautiful mussels and clams. The stew is spicy, surprisingly so, although that can be toned down with fewer hot peppers. 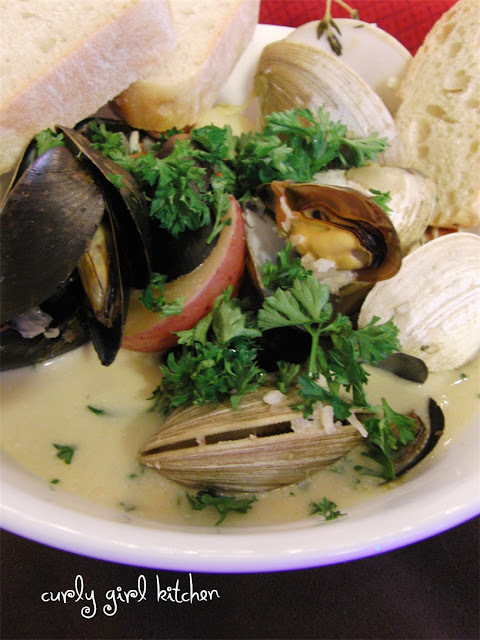 Full of herbs, garlic and spices, clam juice and a little cream, the broth is rich and warming, and the variety of mussels, clams, cod and kielbasa sausage with hearty potatoes keeps you dipping your spoon back in for another taste. Be sure to have a loaf of your favorite crusty bread for dipping into all that delicious broth. Place the peppers on a baking sheet and roast under the broiler until the skin is charred. Let cool, then remove the peel, stems and seeds. Chop the peppers. In a large saucepan, heat the olive oil over medium heat until it shimmers. Add the sausage and cook for 3 minutes. Add the peppers, onion, garlic, thyme, bay leaves and crushed red pepper. Season with salt and pepper. Cook until the vegetables are softened, about 5 minutes, stirring occasionally. Stir in the clam juice or fish stock, potatoes and tomatoes. Cover and simmer over medium low heat until the potatoes are tender, about 25 minutes. 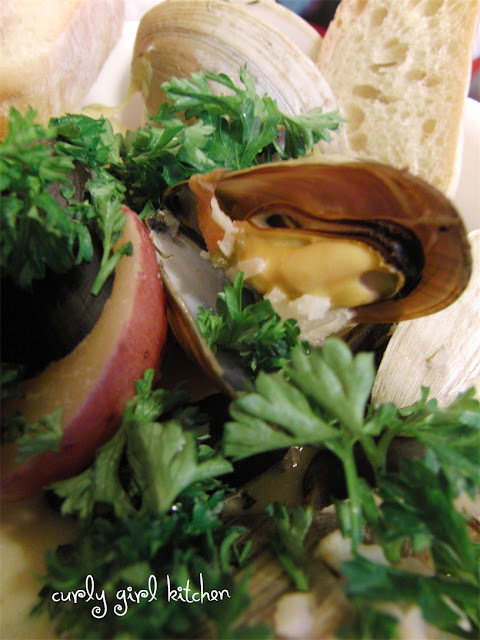 Add the clams to the saucepan, cover and cook over medium low heat for 3 minutes. Gently add the cod and mussels, cover and cook until the clams and mussels have opened and the cod is cooked through, about 8-10 minutes. Discard any of the shells that don't open. Stir in the cream, taste the broth and season with salt and pepper if needed. Ladle the stew into shallow bowls, garnish with the parsley and a squeeze of lemon. Serve with the bread. Note - this is pretty spicy, although we may not have discarded all of the seeds from the peppers. For a more mild spiciness, only use 2-3 peppers. Recipe adapted from Food and Wine, January 2013 Issue.